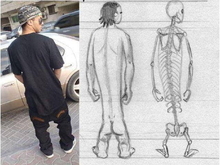 They are referred to as “homo slackass-Erectus”. Created by natural genetic evolution through constant spineless posturing, and spasmodic upper limb gestures, which new research has shown to cause shorter legs and an inability to ambulate other than in a shuffling gait. Not likely to do well in the 100 yard dash and easily nabbed by local law enforcement! It's funny, and kind of creepy, too. Thing is, they think they look terrific. It's called the Mentally Defective Look, and I am sorry they get to vote. I'm surprised the look is still with us, but I suppose there aren't that many alternatives for some folks. I'm surprised this style of dress has persisted, but I suppose there is nothing else to move on to. I hope you are having a good holiday season, Dottie. Please don't forget to post a picture of your ornaments or something else to make our day. I saw one of these idiots in Costco the other day. I think he noticed my stare of disdain. I wanted to say, "Too bad Costco doesn't sell belts." St. George? I think some time you should call me and say 'I'm going to be in St. George on such and such a day.' That's only a couple of hours from here. Don't even need much notice. I love those COPS shows where they chase one of those guys down, and the first thing the cops do after putting the guy in cuffs is pull up his pants for him. is that thats why we call em short asses? belly and go way too low in the back. It's just so dumb looking - those huge baggy pants on some stick thin little guy. Oh I've seen them--and how they hold them up!!! Coming to a mall near you. Maybe that's why I never go to the mall. We can't figure out how that can be comfortable, and how they can enjoy walking all gimpy. Okay, what am I missing??? Looking at the young men walking down the street, their pants have no visible means of support, so they bone structure must have evolved to this point in order to keep them up. I guess you lead a sheltered life there to have not seen them with their droopy pants.